If you are a Comcast customer, have a compatible DVR and an iPad (or iPhone), you have access to a free app in the iTunes store that is definitely a game changer. I’ve used myDVR on my iPxx devices to remote schedule recordings, and I watched the CES demo video that Brian Roberts did and drooled. After installing the app, at first run, a welcome screen appeared, which I dismissed (being a Type A) kind of geek. Actually, after logging in, I could tell that the application already knew about my two DVR boxes as they were already paired from my use of myDVR. 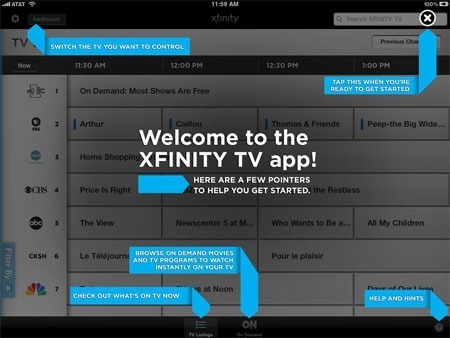 The Guide in this new app is FAR more usable than the one included with the original Comcast iPhone app. There are filters, as shown below (but I have not yet found a way to specify favorite channels. Filters aren’t “sticky” so being a HD snob, I do have to turn the setting for HD only to ON each time I launch the app (and am hoping this will change to a sticky setting). Once a show is selected, two choices are available, record or watch on TV. Record works in the same way as the older myDVR app, but WATCH TV is awesome. As you can see below, when WATCH TV is selected, an animated icon pops up and the channel changes on the TV. (Full disclosure, when I installed this yesterday, channel changing didn’t work for me. I opened a ticket and it was fixed 24 hours later). 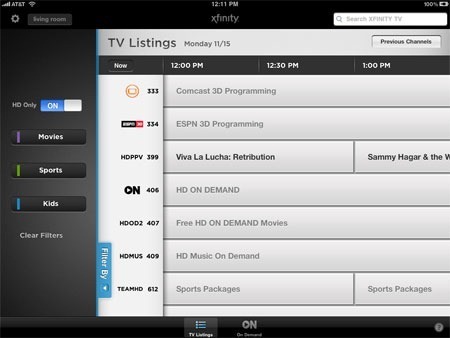 Comcast has more features coming, including the ability to watch some shows directly on the iPad. (Update 11/17) Engadget has posted a video showing off both current and future capabilities of this app. Currently (and I’ve reported this to Comcast), the On Demand listing in the app isn’t as up to date as the EPG on the STB itself. Also, with On Demand, you still have to pick up the Comcast (or Harmony-whatever) remote to confirm “purchase” of an On Demand asset. I’ve asked that they consider a settings option to override this annoying behavior. We’ll see.. (I’m thinking of getting a Red Eye mini which will at least let me confirm from the iPxx device). What makes this app interesting to me is that, to change channels, NO IR device is needed. This is a good thing because the iPad/iPhone devices do not have onboard IR (although there are some third party add-on devices available). The iPxx device actually communicate with the DAC (Digital Addressable Controller) via some web service that sends commands to the local DAC when you make a channel selection over your WiFi or 3G Internet connection. To accomplish a real time channel change, a lot of moving parts need to communicate and work seamlessly. I’m impressed. Thanks, Comcast, for a great contribution to my connected home lifestyle! 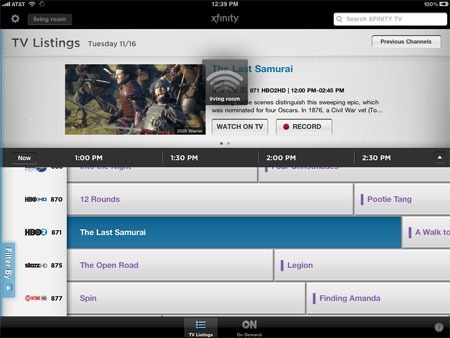 This entry was posted in Uncategorized and tagged Connected Home, iPad, iPhone, Xfinity. Bookmark the permalink.